Looking for the right nutraceutical tablet manufacturers for your new dietary supplements business can be quite challenging. When you have plenty of options online, things can be confusing. That’s why it’s important to focus on your criteria before choosing a private label partner. How Can A Tablet Manufacturer Help You? With a reliable and trustworthy tablet manufacturer as your partner, you can easily launch a dietary supplement brand. However, it may take time before you could assess the reliability and trustworthiness of a supplement manufacturing company. So, choose a truly reputable organization to manage production risks and avoid production hassles. Since 2003, Vitakem Nutraceutical, Inc. has helped countless online entrepreneurs worldwide. We certainly go beyond manufacturing high-quality vitamins and supplements in a timely manner. 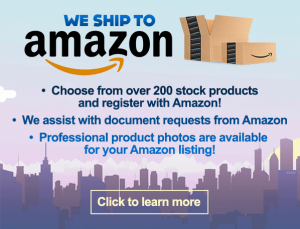 We also offer Amazon and drop shipping services, FDA-approved labeling, and market-friendly packaging, among others. You can focus on growing your business while we do the rest. Why Tablets Instead Of Capsules? Tablets and capsules are the most popular forms of dietary supplements. Tablet manufacturers can formulate large amounts of nutrients per tablet serving due to its compressibility. On the other hand, capsules are less flexible in terms of fill weight. In some cases, tablets are even designed to be chewable for kids and the elderly. Tablets are also generally less costly to manufacture. This means you can offer your supplements for a competitive price. Aside from the production cost, there are other factors to consider. Tablets and capsules have pros and cons as a nutrient delivery system, too. In some cases, nutrient absorption can be more effective with tablets. If you want to offer custom formulation in tablet form, your tablet manufacturer should be able to advise you well. Before launching your private label, be sure to partner with only the experts in the health supplements business. Your manufacturing partner should be able to maximize the tablet’s flexibility. 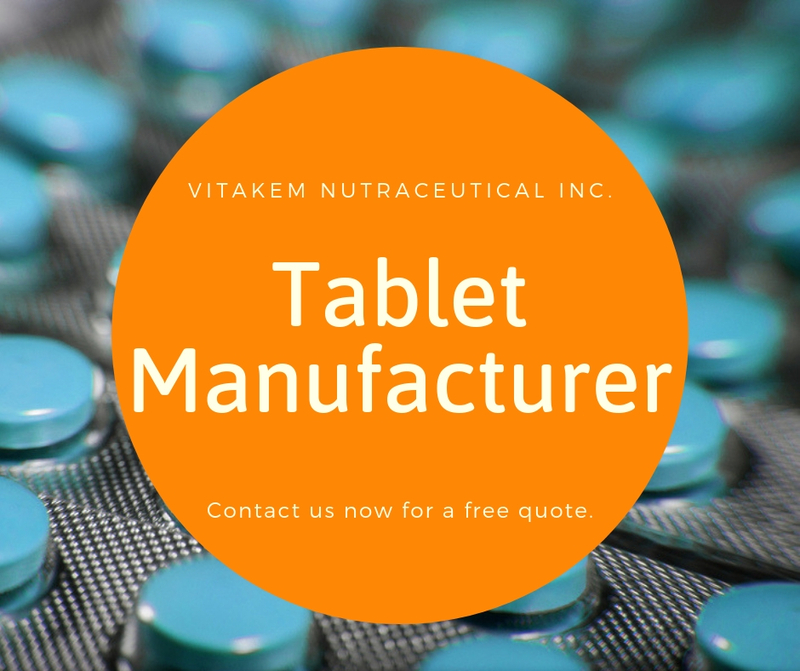 At Vitakem, we can help you offer special tablet formulations to give your brand an edge in the market. 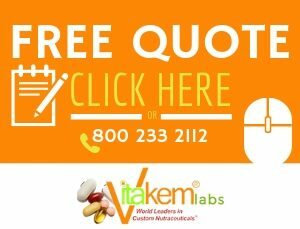 Why Choose Vitakem Nutraceutical Company? Our mission at Vitakem is to provide quality support and innovative services that other manufacturing companies are unable to offer. We believe the best tablet manufacturers provide you with sensible services at a reasonable cost. We even assign one sales executive to each webpreneur and online shop owner to avoid delays in communication, delivery, and troubleshooting. Choosing Vitakem means having a state-of-the-art cGMP laboratory spanning 3,000-square-feet. We use only the best technologies for testing ingredients and monitoring product quality. We also use advanced equipment that allow us to produce 25 million capsules and 30 million tablets daily. There may be a lot of tablet manufacturers that can deliver the products that you want. 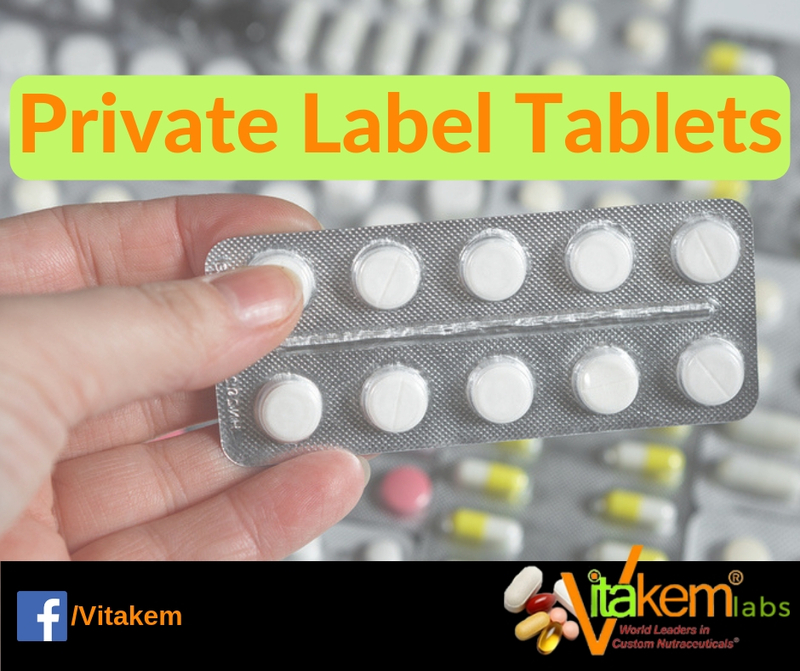 However, Vitakem is among the few outstanding supplement manufacturing companies that can handle your wholesale private label orders efficiently. Some of the best Vitakem tablets are multivitamins, herbal supplements, and anti-stress formulations. We are eager to hear your ideas if you want custom supplements and unique formulations for a specific market. Check out Vitakem’s stock products here. You’ll find available supplements for weight loss, bodybuilding, heart care, liver care, and more. We offer a vast selection of products. In fact, we also offer supplements for pets. Those with cats and dogs can provide their pets high-quality health supplements, too. Ready to launch your private label health supplements business? Contact Vitakem today to get a free quote. You may also call us at 800-233-2112. We are excited to see you build and grow your business while helping people to protect their health and well-being.